The freedom to kill someone else’s kid, sand mining up close, the photos of the year, why don’t players care as much as fans do, and days on the ice of Minnesota lakes. There are only a few issues more emotional than the idea of vaccinating kids. The case of Everlee Stevenson, documented by WCCO, however, shows why laws require vaccinations even though some parents insist they should have the right not to immunize their children against certain illnesses. More than 6 percent of Minnesota parents opt out of immunizations, a decision that apparently almost killed a four month old baby because her sister brought pertussis home from school. Related: When illnesses strike, should schools close? I’ve said it before but it bears repeating: Some of the best photographers in the business work for a radio station. Photographer Alex Kolyer does a marvelous job showing us what the frac sand mining operations proposed for southeast Minnesota look like. It’s part of Elizabeth Baier’s story on the debate over land use in the area. The mine is a complex series of tunnels, air vents and columns about 250 feet beneath the surface of the bluff. 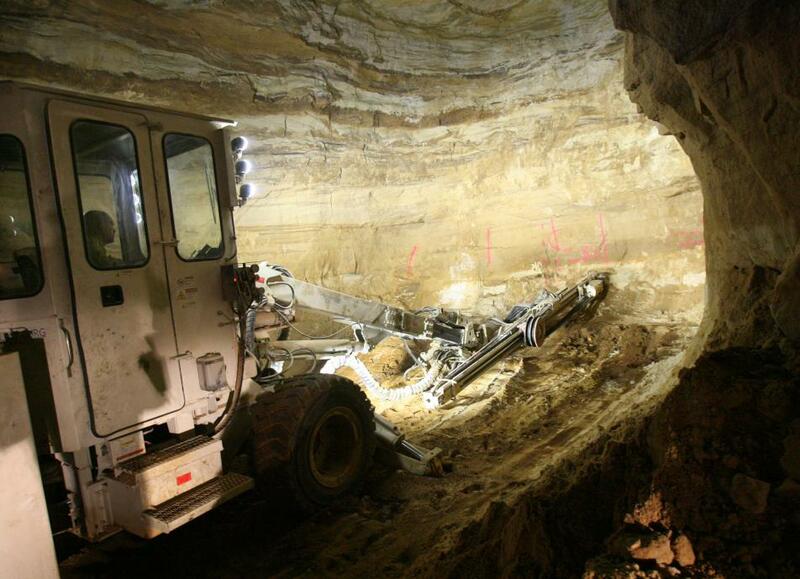 Miners use loaders to grab sand, wash it and haul it out of the mine. After workers load the sand onto railroad cars it heads south into northern Illinois, Oklahoma and Texas, where mining companies use it for “fracking” — a process that pumps sand and water deep into mines to extract natural gas. Rich Budinger, regional manager for Wisconsin Industrial Sand, said his company is working with local communities to address trucking, noise and air-quality concerns. He acknowledges some surface mines will turn bluffs into flat farm fields, but said it’s a small part of the overall landscape. It’s well worth reading and a good story on an important issue to Minnesota that isn’t getting much attention because it doesn’t involve a football team. The World Press Photos of the Year were announced this morning. This wasn’t the overall winner, but it won in the contemporary issues category and it’s a topic that often wins photo awards — child brides. Taken by Stephanie Sinclair, it focuses on Tahani (in pink), who married her husband Majed when she was 6 and he was 25. Half of all women in Yemen are married as children. Find all the winners here, but be prepared to spend much of the day looking at them. 4) WHY DON’T PLAYERS CARE AS MUCH AS FANS DO? What is the proper way for a professional athlete to act after his team loses the Super Bowl? This video of Rob Gronkowski and Matt Light of the New England Patriots is attracting attention because they’re not still huddled in their locker hours after their team lost. I’ve always felt the Happiest Place on Earth was not Disneyland, but the hallway outside NBA locker rooms after a playoff elimination game. The players on the winning team are happy to keep playing, and the players on the losing team are happy to be going on vacation. The losers loudly joke with the winners, exchange phone numbers with them, brag about their upcoming trip to Mexico, then put their children on their shoulders and skip into summer. Related: A guy roams the country, apparently, to do little more than jump on the back of high school and college athletes. He’s been spotted in Fargo Moorhead. Tread from Joshua VP on Vimeo. None of these is in Hennepin County, which has banned vehicles from lakes. We will now wait for the first driver to lose his pickup in a Hennepin County lake because he thought he knew more about the safety of the ice than the people telling him he couldn’t drive on it. “Hey! You just hit a $100,000 vehicle!” he yelled. He was a big man in his late 30s. His body language told me I was going to get socked in the jaw. I wondered what it would feel like. For the first time since 1978, regulators have approved the construction of new nuclear power plants in the United States. Today’s Question: How have your views on nuclear power changed over the years? We haven’t put together a News Cut Quiz in months. It was a fairly busy week, so let’s plan on having one later this afternoon. Midmorning (9-11 a.m.) – First hour: Rebroadcasts of conversations with Grammy winners Martha Reeves, Rodney Crowell and Al Jarreau. Second hour: Rebroadcasts of three of the four Talking Volumes events with Stacy Schiff, Jennifer Egan and Chuck Palahniuk. Midday (11 a.m. – 1 p.m.) – Both hours:Bright Ideas; Stephen Smith with Dawn Upshaw and Donnacha Dennehy on the art of collaboration. Science Friday (1-3 p.m.) – First hour: Are the health claims about yoga true? Second hour: A look at audio science. Plus, learning to play music at any age. I don’t care if he’s out having a good time after losing the Super Bowl. I would be a mad at him if I were a coach, owner, or teammate watching him dance around like that while just hours before that, his ankle had about 50 miles of tape wrapped around it. I am incredibly frustrated by the parents who choose not to vaccinate their children due to scares from proven junk science and celebrities appearing on talk shows. If the scientists with the real facts were given equal time in the media we may not have tragedies like example above. Can you imagine an episode of Oprah praising the benefits of Pit Bulls for families with children? Related to the vaccine debate: Don’t bring your sick kids to public places. Like bringing your kid with measles to the super bowl village. That photo reminds me of the book, I Am Nujood, Age 10 and Divorced, which opened my eyes to child marriage in Yemen. These poor girls have no rights. Perhaps the Arab Spring will bring some change. And hopefully the media will also help. Regarding the photo of the child brides: I, for one, am looking forward to a world where women and children are treated with human decency as a rule. The warm fuzzy concept of cultural relativity has left significant parts of the planet in the iron age regarding human social and moral development. And the right to follow the supposed teachings of some all- powerful guy that lives in the sky is almost always the rational for this type of brutality – be it in the mountains of Afghanistan or the halls of the Vatican. Nobody bit about reactors? Me, then: it’s about time!